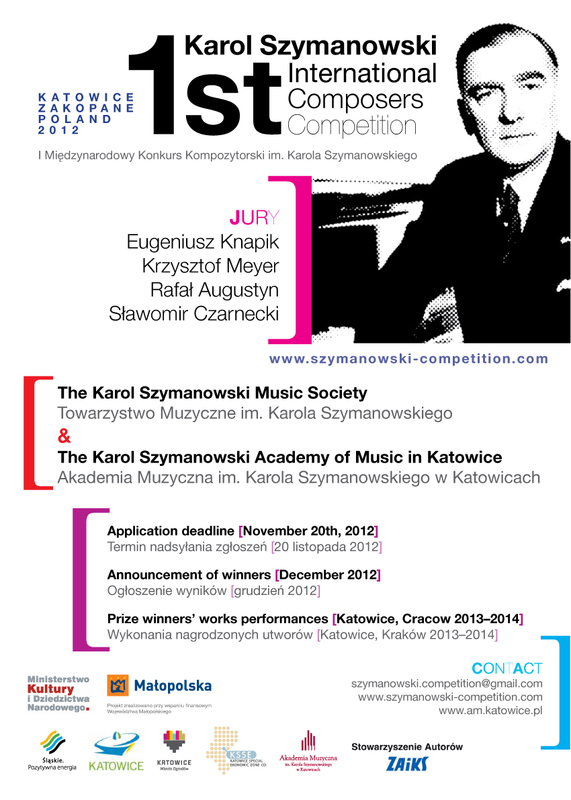 To commemorate 130th anniversary of the composer’s birth the Karol Szymanowski Music Society announced 1st Karol Szymanowski International Composers Competition Katowice 2012. Competition was organized by the Karol Szymanowski Music Society in collaboration with the Karol Szymanowski Academy of Music in Katowice. The subject of the competition was a piece for great symphony orchestra. Required duration of the composition was 10 – 16 min. The members of jury were all members of the Karol Szymanowski Music Society: Eugeniusz Knapik – chairman, Krzysztof Meyer, Rafał Augustyn, Sławomir Czarnecki. 176 competitors from all over the world (from 36 countries) took part in the 1st Karol Szymanowski International Composers’ Competition: Poland (28), Italy (21), Germany (12), USA (12), Japan (11), Great Britain (10), Korea (8), Greece (7), Spain (6), Ireland (6), Russia (6), China (5), France (4), Canada (4), Sweden (4), Hungary (4), Australia (3), Brasilia (3), Argentine (2), Croatia (2), Mexico (2), Romania (2), Cyprus (1), Czech Republic(1), Denmark (1), Israel (1), Malaysia (1), Morocco (1), Portugal(1),Serbia (1), Slovakia (1), Syria (1), Swiss (1), Ukraine (1), Turkey (1), Mauritius (1).